I've been working on my gaming setup for a while, and finally have it at a place I'm really pleased with things. I thought I would take a bit of time to document it for those who may want to try their own hand at this. My basic premise was to try and get the best signal I could out of the systems, and have things set to just work when turned on. 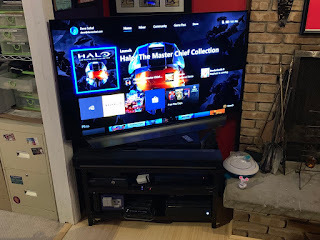 Originally I thought I would do everything on the one main TV in the bar, but I was inspired by the guys at My Life in Gaming that I didn't need everything on one system, particularly because I couldn't come up with a physical layout to fit everything. With that idea, I decided to break it into two parts, with the older retro systems in my office. Additionally, I decided to focus on two standards for the video signals to try and make things easier. For modern systems, the familiar HDMI cable would do. For retro systems, I would focus on RGB, which is supported by many, but not all, of the older systems. For those that didn't support it, I would get the systems modified to support it. With that, I couldn't decide about doing a CRT or HD, and so decided to do both. My idea there is that the CRT is the "original" image, the way the system was designed. That's a full RGB video signal, but thus also standard def. Next to it is the HD TV, showing the upscaled image -- converting the SD signal into a HD one. The SD signal is the way the consoles were designed, so if you are a purist that's the signal of choice, as well as being a reference for the HD one next to it when I compare. The SD signal has "scan lines", which are an SD artifact. The HD signal does not. The CRT is a Sony PVM-20M2U. It has RGB inputs. I've connected that to a par of gscartsw_lite, units, each daisy chained in via a SCART to RGB cable. (Running off that is the audio signal which goes to the speakers). Each console in the rack is hooked up to that switcher. For the HD signal, the primary gscartsw uses one of it's two outputs, to send a signal via SCART cable to the Open Source Scan Converter. The OSSC does the work of taking that RGB signal and making a nice HD signal out of it. The secondary gscartsw runs to the first. That gives me side-by-side SD and HD signals, both for playing and for reference. Here you can see the signal from SD2SNES coming from the SNES displayed in real time on both. I split the HD signal, and run a cable through the wall to the main system, going into input two on the back of the TV. Thus, a simple input change in the main bar lets me get that full signal, and I can play what's coming from the HD upscaled signal on the 55" panel. As I have wireless controllers too for a lot of systems, retro gaming can be done on most of the TVs. In the retro section, I have a RGB modded NES, a stock SNES (as it supports RGB), a RGB modded Nintendo 64, a Nintendo Wii (connected to the gscartsw via a GARO component to SCART converter), and a PS2. Below that is an original Xbox (again, supports RGB) and a Sega Genesis (RGB! ), a RGB modded Atari 2600, a RGB modded Intellivision, a RGB modded Colecovision, and a TurboGraphix-16 with TurboBooster to get RGB. All run to a gscartsw_lite. Moving from my office to the bar, there is the second setup. This focuses on the HD systems. The TV is a 4K LG, which has four inputs. The first is for the TiVo, and the second is the OSSC line from the office for doing the big screen version. There is a 4K HDMI switch which handles the Xbox One X, the PS4 Pro, the 4K Apple TV, and the Nintendo Switch, so the modern systems are on one switch. The final HDMI input is connected to a DVDO Duo, which handles the switching of HD systems. Connected are an Xbox 360, the original PS3 (which handles PS2 and PS1 backwards compatibility), and a HDMI modded Nintendo 64. 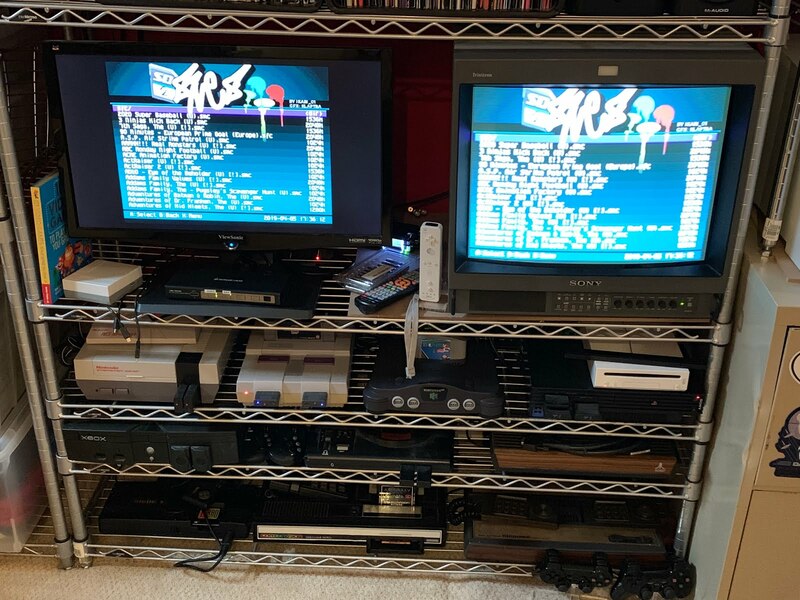 Also connected are a Retron5 (doing HD for NES, SNES, Genesis, Mega Drive, Famicom, Super Famicom, Gameboy, Gameboy Color, GameBoy Advance), and a RetroPi. Finally, going into the analog port and upscaled is a Nintendo GameCube. 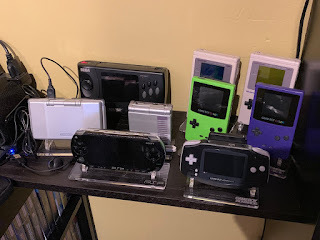 Back in my office, I have a shelf dedicated to the portable systems. That's a Sega Nomad, Atari Lynx, Nintendo DS, Game Boy Advance (with the upgraded display), a PSP, a GameBoy Color, a modded GameBoy Color with frontlit screen, a stock original GameBoy and a original Game Boy (also with upgraded display). 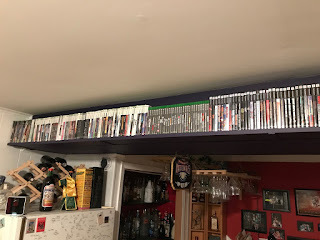 Just below that and to the left, I have the NES/SNES collection of games. 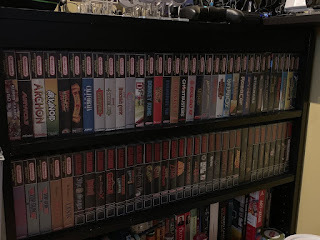 The bookshelf in my office continues the SNES games, N64 games, Genesis games, Sega CD games, Super Famicom Games, PSP games, and original XBox games. It also holds the Game Boy, Game Boy Color, Game Boy Advance, Nintendo DS, and 3DS games. 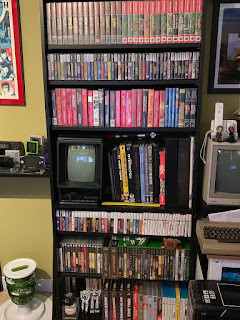 For good measure, there's a Vectrex in there too. 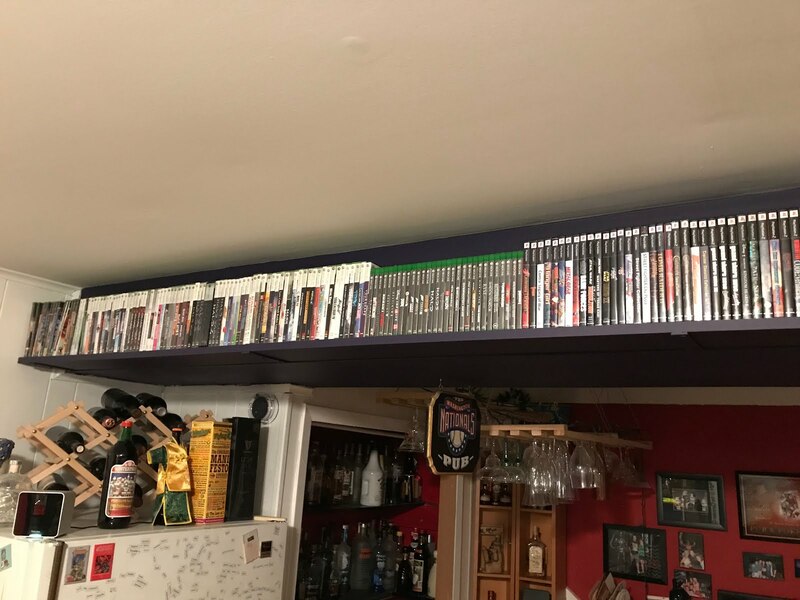 There's a shelf in the bar that handles the Xbox 360, Xbox One, PS1, PS2, PS3, PS4, GameCube, Wii and Wii U games. Everything has a case. 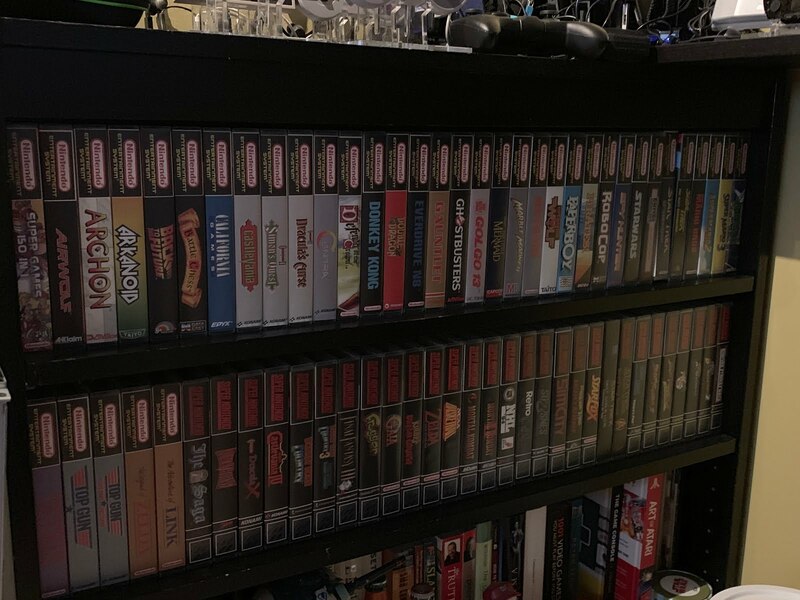 The NES, SNES, N64 and Genesis games all are in Universal Game Cases, and I replaced the CD cases for the PS1 with DVD style cases. Covers come from The Cover Project, and the UPS store has been nice enough to print everything. I've gotten wireless controllers for the NES and SNES which also have charging stations. The Atari, Genesis, N64, and original Xbox controllers are in bins below all the retro systems. The PS2 controllers are wireless now as well. 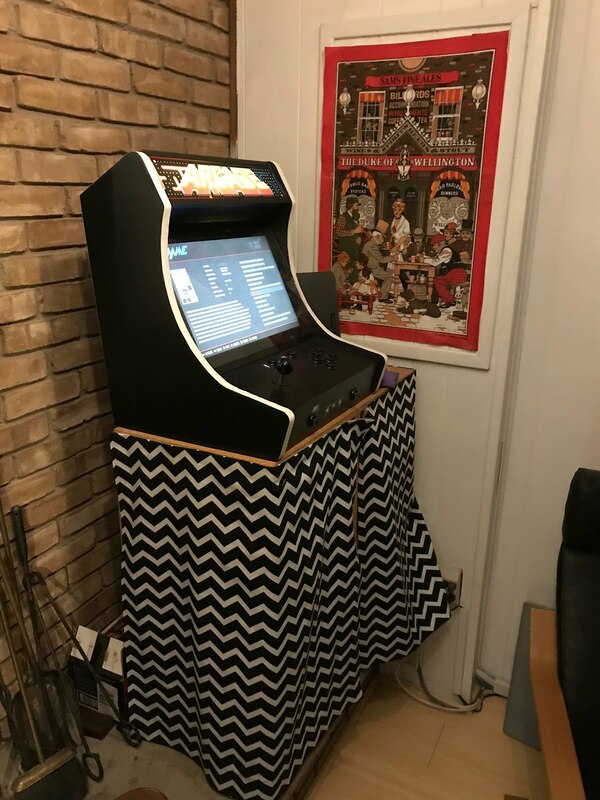 In the main room are stations for Apple TV, XB360, Wii, Wii U, XB1, PS3 and PS4 controllers all under the MAME cabinet, which Sharon has very deftly hidden. The point is to play the games, of course. We've been hosting "retro gaming days" periodically, and have the systems on and fired up for play. Let me know if you want to try something out -- or I'm missing a game you want to play.